There aren't many watches that have anything to do with philosophy. Sure, history, art, engineering, even politics are aspects of watchmaking. But philosophy, metaphysics — watches that make us wonder about time itself — are few. Cartier took a bold risk when it created the Cartier Crash, a watch that beautifully represents the idea that Salvador Dali expressed in his most famous painting, "The Persistence of Memory." Melting clocks in a place where clocks don't belong and aren't needed focus your brain on the fact that time cannot be under our control. Or can it? Can time be manipulated by us? Can time be stopped when we want, so that we can let a perfect moment linger, the way a hummingbird hovers at flower? No one who's honest can deny that they want to control time every now and then, to step outside the known laws of the universe to make the entire universe irrelevant, except for the small part that we happen to be occupying. At a concert, while eating a glorious meal, while making love, or in a park — these are times when the inextricable and relentless push of time conspires against us, and where we want to control it. Enter the Hermès Le Temps Suspendu, which suspends time. This watch risks the ire of the universe by brazenly stopping time so that you can enjoy that afternoon in the park or the first date that has become the date of your dreams. 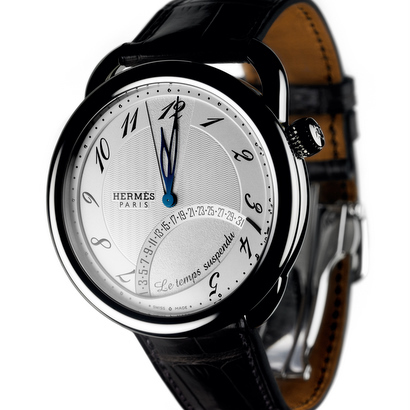 The Hermès Le Temps Suspendu is audacious and bold, and it has a brilliantly conceived and engineered complication to do what no other watch does: It tells the universe to shove it. If you push the button at the watch's 9 o'clock position, the hands retreat, like an army in defeat. They move toward the 12 o'clock spot, making a narrow V-shape for as long as you call on time to halt. While the hands are stopped, the watch's movement continues to measure and track time so that when you push the button again, time resumes its normal behavior. This 43-mm, 21-jewel, 28,800-vibrations-per-hour magical watch has a 42-hour power reserve and costs between $35,000 and $44,000. There are complications and there are complications, but a complication that can stop time is one that I desperately want on my wrist.